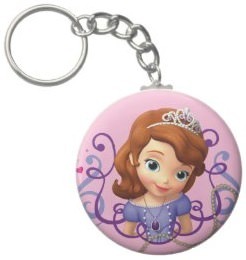 Cute Dinsey key chains are very fun to own and now you can have one of the litte princess Sofia The First. This key chain is pink and round and has a picure of Sofia on it now your keys will be royal because Sofia the First is near them. This key chain is not only great for keys, you can use it to decorate to. Hang one on you backpack, jacket or the wall you can use this key chain for all kind of fun tasks. Come and have a better look at this Disney Sofia The First Key Chain. There is the little princess Sofia. 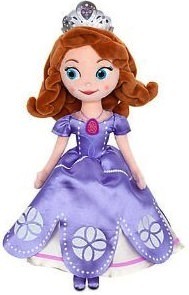 And this is a plush version of Sofia the First and it has all the details that you can expect from this princess. 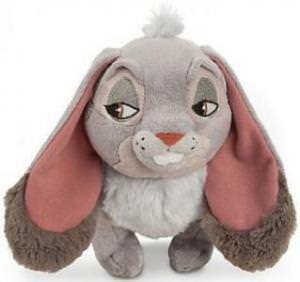 The plush is soft and cuddly and is 13″ high. But be quick as this is a real hard to find item it could sell out quickly. So come and check out this Disney Sofia The First Plush. Plain spiral notebooks are something you can always get but if you want something royal then you have to take a look at this notebook. 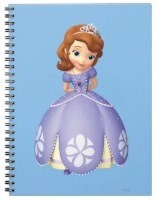 On the front of the notebook you find a new Disney Princess Sofia The First. On the inside of this Sofia The First notebook you find 80 pages of lines paper and that makes it great for almost anything. You can use it at school, the office and at home and if you want you can even use it to write a secret journal about how you would like to be a princess. There is the new princess in town and it is Sofia The First. Did you always wanted to know what it takes to become a real Disney princess? If so then you have to watch the story of Sofia The First. And if you already like Sofia then you probably want a nice t-shirt with her on it. We found the perfect Sofia The First t-shirt with basicly a blank t-shirt that comes in different colors (check it out if you like pink). And has a picture of Sofia The First on it and we don’t need more as this little princess just needs the space to explore. 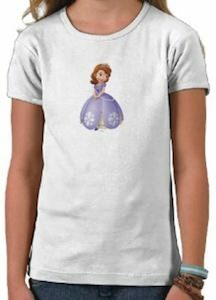 You can get this Sofia The First t-shirt in all kind of styles, colors and sizes and not only for kids, adult sizes are availible to. Time for a new princess in you life? Come and order you Sofia The First T-Shirt.